Our knowledge of workplace metrics has revolutionized how we design office space. Ten years ago, the world of workplace research and data was a different place. When we launched our first Workplace Survey in the UK and US, our ability to capture the how and where of knowledge work revolutionized the way we design office space and measure its performance. Now we are ahead of the curve. Over the past decade, we’ve created the most robust proprietary research program in the design industry. We’ve collected data from 300,000+ Workplace Performance Index (WPI) client respondents, 15,000+ global Workplace Survey respondents, 4,000+ Experience Index respondents, and myriad other data-based analyses. Now administered by the Gensler Research Institute, our workplace research remains focused on identifying the connections between design, business, and the human experience. With all this data collected, some big ideas relating to the future of work and the workplace have begun to emerge. Looking to the next phase of our research program, we are employing a wide range of data collection and analysis methods, informing a strategy of ongoing data monitoring and analysis. In this new “beta” world, we collect data, apply insights to projects, refine our conclusions based upon what we learn, and apply those new insights. The issues surrounding open plan workspaces are a great example. 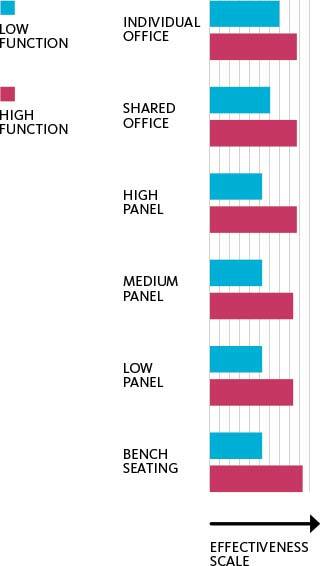 The challenge of open office environments proves not to be their openness per se, but more specific factors around design and employee behavior. Bench seating, for instance, is 25 percent more effective — similar to a private office — when rated highly on noise, adjustability, layout, and access. We’ve also found that innovators are two-and-a-half times less likely to use individual space to socialize; instead, they design appropriate space where productive use and culture building can take place. not always the most expensive. as effective as a private one. In a world where global business is saturated with established brand names, markers of regional culture carry significant value. Our research emphasizes the need to understand local attributes and cultural differences so that we can tailor design approaches. Social spaces, for example, need more emphasis in collectivist or communal cultures, whereas people in cultures that value individualism need different workplace amenities. That directly impacts how we design office space to relate to local context, placing even greater emphasis on social space for Asian and Latin American workers. Similarly, we’ve found that Latin American workers collaborate more than they work alone (45 percent vs. 43 percent), so it’s vital to provide for that in the workplace. Research is a way to focus our attention on the issues that truly matter. Our research shows that balancing focus and collaboration spaces, rather than prioritizing one over the other, is a top employee need. We’ve also learned that the workplace amenities employees want are sometimes unexpected. (Pharmacies and grocery stores, for instance, are valued more highly than fitness centers.) These examples underscore the importance of implementing research-informed design solutions, rather than simply relying on experience and instinct. So what’s next? We keep refining the questions we ask and how we analyze the data. From sensors and ambient data to pulse surveys and other technology-enabled research methods, the integration of the newest tools is a point of emphasis. We’re also mindful of the need to look at data critically so that we focus on data that makes a design impact. With a decade of data under our belts, this approach to research and design will drive our next decade of workplace research. Janet Pogue McLaurin is a co-leader of Gensler’s global Workplace sector. Tim Pittman is research strategy and communications director for the Gensler Research Institute. Both are based in Washington, DC. Dialogue draws many insights from the Gensler Research Institute, which explores the intersection of design, business, and behavior in pursuit of solutions that improve the built world and enhance the experiences of people.